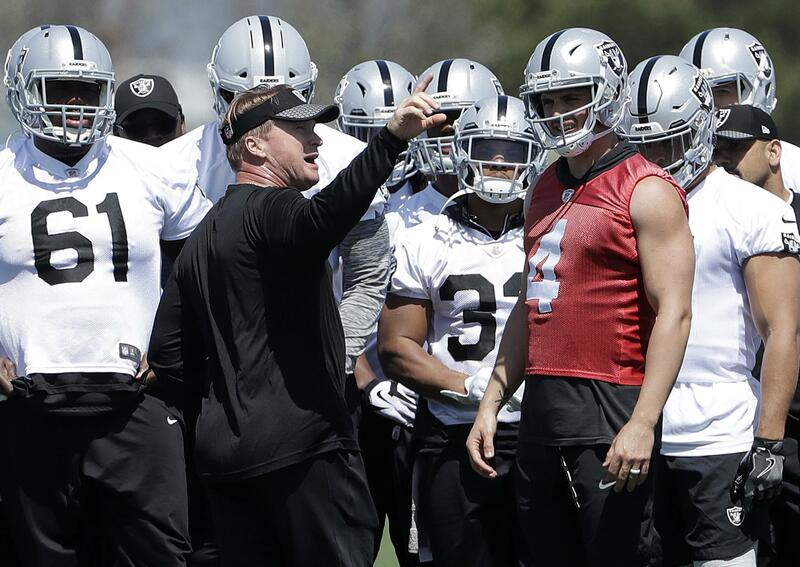 ALAMEDA, Calif. – Jon Gruden yelled out instructions, called out plays and ran an NFL practice for the first time since leaving coaching nearly a decade ago in Tampa Bay. This was the day Gruden had been waiting for ever since he was hired for a second stint as Oakland Raiders coach. The Raiders opened their first voluntary minicamp under Gruden on Tuesday with optimism that a change in coach can alter the fortunes of a team coming off a down season. There were even large video boards on the field, allowing players to watch replays of practice plays immediately after they happened to make corrections more quickly. Gruden said that was something his first saw watching Jim Harbaugh’s practices at Michigan and adopted it himself. Gruden takes over a team that fell from 12 wins in 2016 to just six last season, leading to the firing of coach Jack Del Rio and a second stint for Gruden in Oakland. The Raiders’ facility looks far different than it did during Gruden’s first tenure from 1998-2001 with a workout center that Del Rio initiated and new fields. The team needs plenty of work after last year’s disappointment. The Raiders had major drops in scoring (26 to 18.8), yards per game (373.3 to 324.1) and committed twice as many turnovers (14 to 28) this past season as Carr took a major step back in his development while dealing with a back injury for part of the season. But Gruden sees great potential that Carr can get back to the level he was in 2016 when his play helped earn him a $125 million, five-year extension in the offseason. The defense became the first in NFL history to fail to record an interception in the first 10 games of the season and generated only 14 takeaways all season compared to 30 in 2016. The Raiders have brought in more than 20 free agents this offseason as Gruden has tried to put his own imprint on the team with one of the most significant moves being the signing of receiver Jordy Nelson to replace Michael Crabtree, who was released to make room. But there are also some key pieces missing, most notably 2016 AP Defensive Player of the Year Khalil Mack, who is not participating in the offseason program while seeking a long-term contract before he can become a free agent next offseason. Starting left tackle Donald Penn is still recovering from foot surgery and last year’s top two draft picks, cornerback Gareon Conley (shin) and safety Obi Melifonwu (hip), aren’t taking part in team drills. Published: April 24, 2018, 5:29 p.m.